What Is Optuno Contextual SEO Link Building? Optuno Contextual SEO Link Building is a service that places links to your website on top-level properties (for ex: Wordpress, Blogspot, etc.) with high domain authority across the internet. These contextual links earn you high credibility and popularity with search engines and develop your website’s relevancy. With this service, you can rank your website, in less time, for less money than ever before. 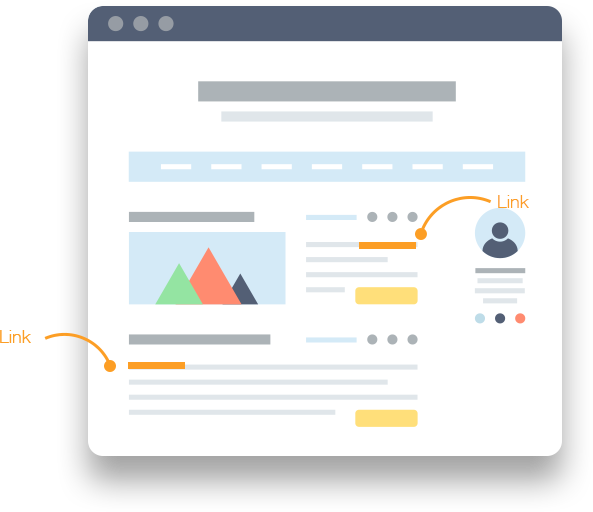 Backed by data from 1000’s of SEO campaigns, Optuno’s Contextual SEO Link Building program works, no matter the industry or competition. In order to rank in search engines, you need to establish link authority and link volume; We do this by executing two campaigns – an Authority Campaign and a Link Campaign. The first thing you need in order to rank is Link Authority, which is the degree of trust and authority a link from a website has. We start by first creating mini-authority top-level properties on high authority blogging sites like WordPress, Blogspot, & Tumblr that link back to your website. These properties serve as the seed for our viral structure and are optimized with relevant, original articles, videos, and pictures. We want them to be filled with quality and relevance for your subject matter. Now it’s time to make them go viral! When an authority site posts an article, other sites immediately begin writing responses that link back to it. We simulate exactly that. We create a viral link structure that pushes link juice up through 3 layers; Web 2.0 Websites, Social Bookmark Websites and Profile Links. This boosts the authority of the top-level site and in turn funnels all of that increased link authority to your website. The amount of links for each of the layers depends on which package you get. The second thing you need in order to rank is Link Volume, meaning the publishing of articles by hundreds of other websites. We slow-drip each article to our own network of PR sites over a period of 3+ weeks. By slow-dripping these articles, we create a steady pace of links. This means you’ll get a natural flow of links over a long period of time, not just all at once. Just get with your project manager and let them know you’re interested in our Contextual SEO Link Building service. Then just take 15 seconds to submit your keywords & URLS that you want to rank in search engine results for. That’s it! Read a magazine. Have a cocktail. Catch up on your favorite shows. Our team of workaholic link builders will get to work writing original, relevant content on websites and building links back to your website. BAM! See your quality links in our detailed Optuno Authority Report. After The Authority Campaign is complete, we’ll continue to slow drip links for 3+ weeks in our Volume Campaign for optimal results! Optuno’s link building strategy was developed for clients in the most vicious e-commerce niches. We focus on creating a natural link structure that follows the exact path of viral content on the web, so your links show up on the best websites and get maximize results. There is no hocus pocus. No snake oil promises. Just a fine-tuned link building system, constantly being refined with real data. Our team of copywriters create original, semantically relevant content around your subject matter. 100% original, Copyscape-checked content.